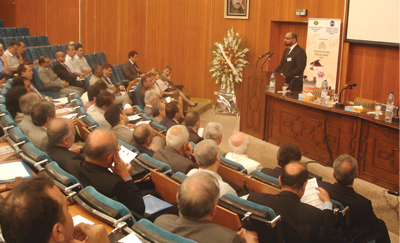 The Higher Institute for Applied Science and Technology (HIAST) organized a three-day international seminar on “Bridging Gaps for Industrial Development: Interface between Academia, Policy Making, and Industry”, from 27th to 29th July 2009, at HIAST, Damascus-Syria, under the aegis of the Islamic Educational, Scientific and Cultural Organization (ISESCO) and the Commission on Science and Technology for Sustainable Development in the South (COMSATS). The purpose of the seminar was to create awareness and highlight the usefulness of industrial development in the developing economies. Besides the host country, Syria, participants from Egypt, Iran, Jordan, Lebanon, Pakistan and Sudan, took part in this event and presented papers on the subject covering its various aspects. The seminar provided an opportunity to scholars, academicians, scientists, industrialists, government-representatives, policy-makers, entrepreneurs and non-profit organisations to interact, share ideas for fostering collaborative leadership skills and develop partners to meet the challenges of the new global economic landscape. In his message, Dr. I.E. Qureshi, Executive Director COMSATS, appreciated HIAST’s initiative to hold the seminar in Syria and assured it of COMSATS’ continued support for its future ventures. Besides highlighting COMSATS’ efforts towards sustainable development in the South, he called to attention the role that Academia-Industry partnership could play in achieving a number of social objectives, such as employment generation, poverty alleviation, gender equality, higher labour standards and an improved access to education and healthcare. A strong participation from the Syrian industrial sector, ministries and educational institutions, apart from foreign delegates, played a vital role in the success of the seminar. The recommendations that were made provided guidelines for scientific research, suggested improvements in educational system and curricula, and took under consideration the avenues for transforming scientific research into industrial applications. Furthermore, it was suggested that universities, research centres and industrial institutions should be provided with more forums for exchange of experience in the form of annual exhibitions.